What effect are the torrents of information in today’s world having on political decision-making processes? Klaus H. Goetz studies the impact of time pressures on politics, and discerns signs of rising uncertainty and unpredictability. “How much cash do we have?” asked Bryan Marsal. “None at all,” was the reply. This was the opening gambit in Marsal’s unsuccessful attempt to save the investment bank Lehman Brothers from insolvency in September 2008. At least that’s how he described it in interviews a year later. The fall of Lehman triggered a global banking and financial crisis, in which politicians had to make momentous decisions within a ridiculously short time span. “As Peer Steinbrück, Germany’s finance minister at the time, later put it: ‘the global economic order was on the verge of collapse’” says Klaus H. Goetz, a professor at the Geschwister Scholl Institute of Political Science at LMU. Lack of time is often a bane in politics, but time itself can be a resource. It’s possible, as politicians well know, to make time work in one’s favor. One way of doing so is to set deadlines so as to put pressure on others, as Britain’s Prime Minister Theresa May learned recently during the Brexit negotiations. When the EU decided that not enough progress had been made in the discussions on the modalities of Brexit at the end of October, they postponed the planned summit meeting. Another way to make creative use of time is to dispense with conventional procedures, for example by announcing a new legislative initiative not in parliament but in the press, so that opposition must scramble to react. Getting the timing right is a very important part of the imaginative use of time. “Often, what one does is less important than being seen to do something,” says Goetz. A feel for timing is one skill that Donald Trump undoubtedly possesses. By early November 2018 he had sent over 39,600 tweets. Many of them were contradictory, but they keep his political opponents at sixes and sevens. “Trump refuses to play by the rules. This makes him unpredictable, and there are increasing signs that this is his governing strategy. The lack of consistency makes it very hard for the opposition to organize an effective response and put pressure on him. Effective opposition requires a certain degree of predictability on the part of the government.” In addition, everything that Trump says, every new conflict he provokes, is immediately picked up by the media. And this makes it extraordinarily difficult for the opposition to put their policies before the public. Klaus Goetz notes that this dramatic change comes at a very difficult time. “We are in the middle of a debate about sustainability, and long-term environmental policies that can be carried though for decades are required to respond effectively to climate change. But if voters decide at ever shorter notice and do not reward parties that take the long view, how can political systems be organized to enable inherently long-term projects to be decided upon and implemented?” This conundrum also applies to other large-scale projects, such as the reform of pensions or healthcare. These developments also present a challenge to Goetz’s own discipline. “As social scientists we are trained to recognize regularities and patterns. But what happens when hitherto accepted rules no longer appear to matter, and we are faced with patterns of behavior for which the explanatory models that we used in the past are no longer adequate?“ It may well be the case, he says, that the new rules are already in place, but haven’t yet been discovered. “I believe that, under the influence of a drastically altered media environment, new forms of political behavior are in fact emerging at the level of individuals, but also at the level of political parties and governments. We can sense the upheaval, but we do not yet have the ability to recognize what is really novel about it.” These are among the issues relating to the dynamic developments and alterations in political power centers that Goetz wants to explore with an international team of researchers at CAS. In recent years, much of his attention has been devoted to the significance of synchronization. “In politics, one is often confronted with the need to take account of processes that advance at different rates, and to decide in what temporal sequence decisions should be taken. This is particularly important at the level of international organizations, such as the European Union with its 28 member States.” In a number of projects, Goetz has examined the temporal dimension of decision-making processes in the EU and shown how time and power are intricately enmeshed with each other. On the one hand, fixed schedules are indispensable for the EU with all its complexity. 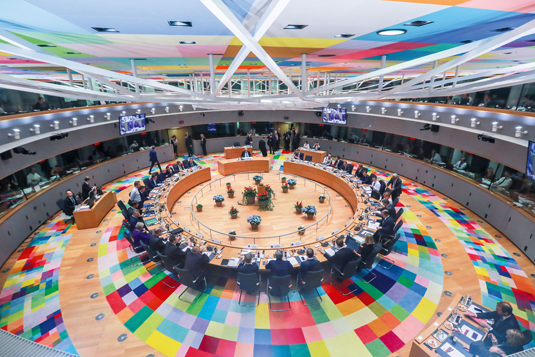 “But decision-making in the European Union is in part dependent on the timing of national elections in its member States.” Under these circumstances, the fate of political projects may be contingent on the sequence in which they are tackled. In the spring of 2017, Emmanuel Macron, a convinced European, had just won the first round of the presidential elections in France and – before the second round – Jean-Claude Juncker, the President of the EU Commission, seized the opportunity to present his concept of a ‘European pillar of social rights’, designed to guarantee access to, and equality of opportunity in the labor market for all citizens of the EU. “The reason why the role of time in politics is such an exciting subject is that we have highly institutionalized procedures and schedules on the one hand, and the creative use of timing as a tactical and strategic resource on the other.” His own research on international organizations has given Goetz a sharp eye for the interaction between these two aspects of ‘political time’. “To dissect the power relationships within an organization you only need to observe who can afford to let whom wait for an appointment,” he says. Restructuring expert Bryan Marsal did not have to let Lehman Brothers wait very long for an answer, when the bank offered him the job as Vice-President for Restructuring. After thinking it over for a few minutes, he accepted the position. The losses incurred in the first 48 hours after the declaration of bankruptcy are estimated to have been in the region of 50 to 100 billion dollars. “Lehmann collapsed in the blink of an eye,” he told Spiegel reporters in the course of a subsequent interview in which he recalled the events of September 2008, when the avalanche that buried Lehmann Brothers almost toppled the global economy off the cliff-edge. Prof. Dr. Klaus H. Goetz - Holder of the Chair of Political Systems and European Integration at the Geschwister Scholl Institute for Political Science at LMU, Goetz (b.1961), studied Political Science in Tübingen, Massachusetts and at the London School of Economics and Political Science (LSE), obtained his doctorate at Oxford University’s Nuffield College. His academic career had taken him via Speyer to the LSE and Potsdam, before he came to LMU in 2013. He has already completed several research projects on the significance of time and timing in politics. Beginning in the new coming year, he will lead a Research Group devoted to the study of “Exceptional Political Dynamics: Temporality, Turbulence, Transformation” at LMU’s Center for Advanced Studies. He also is the Editor of “The Oxford Handbook of Time and Politics”, which will appear in 2019/2020.